Manufactured from 1930 to 1946 by Eastman Kodak Co. of Rochester, New York. 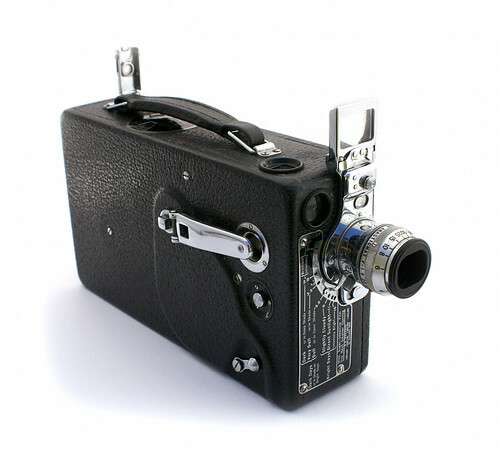 Manufactured for over 15 years, it is the longest-lived of Kodak’s 16mm movie cameras. It took 50ft or 100ft spools of film. It has a leather-covered metal body, a folding Newton finder and a waist-level brilliant finder. The spring wound motor was settable to 8 or 16 fps and it had an interchangeable Kodak Anastigmat 25mm /f1.9 focusing lens. Though not shown here, I have the full set as purchased from an estate sale. I have the camera with it’s leather case, it’s instruction manual, the book “Making The Most of Your Cine-Kodak Model K”, an extra drive belt, a 100 ft take-up spool, the art-deco box for the camera (OK, that’s shown here…), the Kodascope Model K-50 Projector and it’s “condensed” operating instructions and case. I even have the carbon of the original receipt from August 5th of some year for $288.36 for the entire set from store “B. Altman & Co.” of Fifth Avenue, New York, New York.